CODA TopPage » English » Activities » Direct dialogue with site operators, copyright-related organizations, etc. 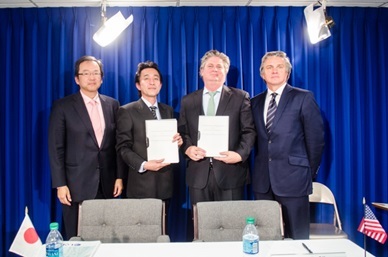 CODA and the Motion Picture Association (MPA) signed a formal agreement to strengthen their joint copyright protection efforts and develop new initiatives to best address the current challenges of online content theft of creative works across the world. Based on the strong partnership cultivated over nine years between CODA and MPA (that include our joint efforts we initiated in 2005 to take measures against hard-goods piracy in Asia), we share information concerning the global problem of online copyright infringement and seek solutions to them through discussions and periodical meetings. In particular, we are interested in enforcement of rights in practical, relevant yet effective manners, taking measures against illegal sites with assistance from intermediaries, discussions technical solutions, and lobbying for the government of respective nations. Signed a memorandum of understanding (MOU) with four major Chinese UGC sites concerning intellectual property protection. Signed a memorandum of understanding (MOU) with the Korea Federation of Copyright Organizations (KOFOCO) concerning enhancement of intellectual property protection. Signed a memorandum of understanding (MOU) with a major Chinese video streaming site concerning promotion of intellectual property protection and legitimate content distribution. Signed a memorandum of understanding (MOU) with the Motion Picture Association (MPA) concerning intellectual property protection(photo).